Well Fed Farms began with the idea of producing good food; meat and produce that is healthy, clean, delicious and grown with care. Experience has shown that a label proclaiming “organic”, “natural” or ‘”local” does not necessarily make a product healthy or sustainable. These are often just buzzwords and even ones that require an independent certification have loopholes. The best food comes from farmers who truly care about land, animals, and community; people who operate on a small enough scale to spend time with both the food they produce and the customers who eat it; businesses that operate transparently and welcome anyone to stop by to see for themselves where their food comes from and how it is grown. Well Fed Farms embodies these values. 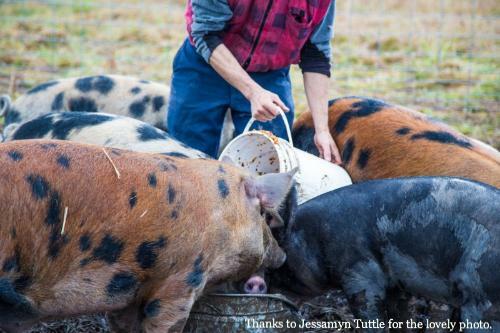 Animals are raised outdoors on pasture, where they can scratch, root, play, and forage. Their diets are completed with high quality, GMO free grain rations sourced from independently owned, local mills. Excellent feed, supplemented with abundant forage, results in delicious, nutrient-rich meat and eggs. An open, low stress environment where they are free to exercise their natural instincts results in healthy, contented animals. You can see and taste the difference. Ecological balance is one of the most important principals on a farm that strives to be truly sustainable. At Well Fed Farms, rotational cropping and grazing, composting, and nutrient cycling are all employed to care for the soil and water resources that support the continued productivity of the land. Well-managed, healthy land enables the production of high quality, delicious food, which provides the nourishment needed to sustain us and complete the cycle, keeping land, animals, and people all Well Fed.